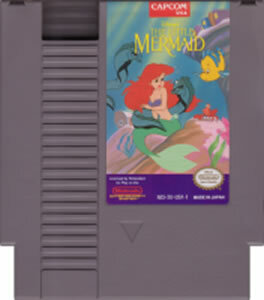 Disney's Little Mermaid original NES Nintendo Game cartridge only - Cleaned Tested and Guaranteed to Work! Disney. Capcom. A great partnership for the NES ! On par with Rescue Rangers : great graphics, nice music and hard enough to give you a little trouble. Very far from just a girly game :) A good addition to the collection. Bought this to play with my 4yr old daughter and she loves it. Game was in great condition and game play is great! Growing up I wasn't afan of the movie on which this game is loosely based. It had some catchy songs, Poor Unfortunate Souls and Les Poissons to nameacouple, but beyond that it wasn't a movie I would sit down and watch, wich is suurprising considering that nowadays I don't mind it so much. The story is at best a loose interpretation of Disney's classic. It has Ariel, Prince Eric and Ursula in it as well as a few of Ariel's other friends, but that's about it. The story is that Ariel fell in love with Prince Eric, a fish-eating human, and went to the Sea Witch Ursula for help. Ursula accomodatingly turned Ariel into a human and set her on her merry way. Sometimelater, some of Ariel's ocean friends came to Eric's castle and told Ariel that Ursula had since cast a spell over all things in the sea, forcing them to do her bidding. Ariel, who apparently did not have to trade her voice in exchange for her new form, told Eric the truth about her nature and, despite his warnings, wentmermaid and returned to the sea to try to save her people. You play as Ariel, who must fight her way through five levels of action, from a sunken ship to a sea of ice to an underwater volcano. Ariel's means of defedingherself are interesting. She can throw bubbles and shells at hher enemies. The bubbles in fact can be used to capture enemies which Ariel can then throw at other enemies. Throwing a shell at a treasure chest, plenty of which you'll find throughout your quest, will yield differently colored pearls wich can increase the strength and range of Ariel's bubble attack. At the end of each level is a boss battle whic usually involves contending with not only the boss itself but various smaller enemies. The audio isn't what I might have chosen for a Little Mermaid game. The music in particular is much to cheery and in my opinion doesn't really fit the levels. It's not bad, and in fact most of the tunes are actually quite catchy. It's just not what I would have chosen. Fortunately while the main boss theme sufers from the same inappropriate cheeriness as the level themes, the theme for the final battle, whilestillabitmore upbeat thanI miht have liked, is certainly not ceery. Unfortunately you won't hear many tunes from the movie. In fact there's just one, a surprisingly excellent NES rendition of Under the Sea. I could listen to it for hours it's that good. Overallthisisa game worth checking out eve if not owning. That secondd would depend on your own personal taste in gaming. But it's definitely one of the better movie-to-game adaptations to be found on the NES. LJN could have done with taking a leef or two out of Capcom's book given the crap they produced. This is one of the best side scrolling platformers the nes has to offer. 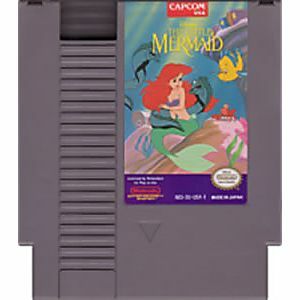 ANYTHING disney that was made by capcom on the nes is a great game haha. It's a side scrolling platformer in which you are a mermaid. Did not buy this for myself (bought for someone who loves Disney) but have played it and would recommend that you do the same. 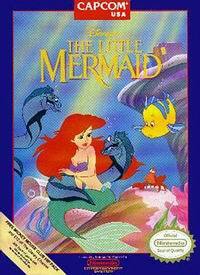 Little Mermaid is an action game made by Capcom that is based off the Disney movie of the same name. Do NOT overlook this game. Despite a girly looking cover, and being about a little mermaid, the game is pretty fun. It was the first game I ever beat, (at age 3) and I still revisit it from time to time. It's fairly short, but has nice graphics, music, and gameplay. Worth a play for any NES owner.